All Wireless Wildlife products are developed, manufactured and serviced inhouse, enabling us to provide affordable quality products to help conserve and protect our wildlife heritage. Please find our main product lines described below. Please do not hesitate to contact us with your specific project requirements for us to propose the best solution. The tracking device transmits and stores the location and behaviour information periodically, according to an established scenario (user defined schedule), when a defined violation of “normal” behaviour is observed or on request from the user. This data is received in real time by a base station located within range of the tagged animals or the data is downloaded when the animal enters a coverage area. In addition to the base stations, additional download receivers or “repeater stations” can be positioned within the study area or mounted on vehicles to extend the coverage area of the base station by relaying transmissions from the tags to the base station if required or downloading data from collars and dumping it to the base stations when in range. The base station re-transmits data to a remote server through a global system for mobile communications (GSM) network. The data is stored and is protected on the remote server through a series of on and off site backup systems. 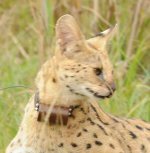 The location and behaviour of all the tagged animal as well as telemetry systems operational status data can be accessed by a user in real time through an internet based web browser on a password protected website. The communication channels (from the tags to the end user) are bidirectional, which allows the user to change any parameters on the tags or radio tracking and monitoring system via a web-browser. GPS: GPS for accurate positioning. UHF Modem: Download range up to 5km (ground) and 10km (air to ground). Sensing Capabilities: Activity and temperature sensing. User specific sensors can be added. Advanced Scheduling: Scheduling remotely changeable. “Position-on-Demand”: GPS location of the animal within 5 minutes of operator request. 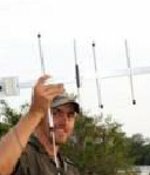 Remote monitoring: Monitor remotely utilizing the Wireless Wildlife Base stations and Web-based user interface. GPS: GPS for accurate position calculation. UHF Modem: Download range up to 5km (ground) and 10km+ (air to ground). Data Storage: All data stored on-board. Sensing Capabilities: Activity, Depth, Temperature. Digital manual tracking: Switch device to continious tracking mode to pin point its location using the Wireless Wildlife directional antenna tracker. The base station is the central operating point of Wireless Wildlife WWxxxxAS products utilizing the Wireless Wildlife UHF system backbone. The base station is the link between the operator and all the tracking devices within range of the base station or adjacent relay stations. A relay station generates the same coverage footprint (range) as that of a base station, but only relays all tracking telemetry data within it's range to the base station for redistribution to the operator. Each user gains access to the Wireless Wildlife user software web interface using a unique user name and password. The user software interface is completely web-based using your normal web browser. This enables users to access their data through any Internet connection. All updates for the user software interface are done on the Wireless Wildlife server, ensuring that all users implement the latest software.